Slipped disc in neck is one of the most painful conditions seen. Slipped disc in neck is one of the most painful and difficult conditions seen; the ache in the arm is especially disturbing at night. This is one of the most stubborn problems seen at the Chiropractic Coalface; I have finally decided that less treatment, rather than more is the solution. Winning the patient's confidence in the midst of such pain is vital, and stems from a thorough examination, a candid approach about the seriousness of the condition and an acceptance that Rome wasn't built in a day. Nor in a night when a slipped disc in neck is often at its worst. Any one of the three, or several in combination can affect the nerve root. 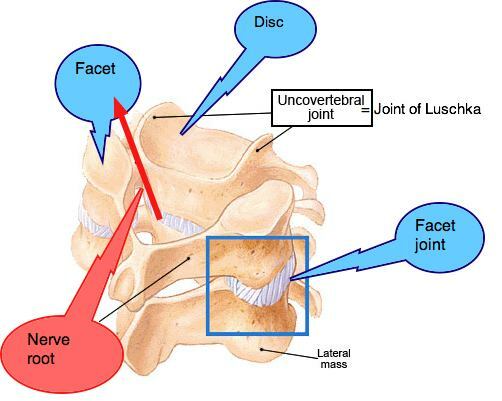 See how the nerve root (illustrated by the red arrow) lies between the IVD, the facet joint and the joint of Luschka? Mr G, a fifty year old body builder consulted me with bad neck pain and headache radiating vaguely, but severely in the right shoulder and lower arm. The arm felt weak and there was frequent pain and tingling in the arms and hands. Bench press in particular was difficult. The pain had begun some five weeks previously, with no known cause. He recalled no injuries to the neck. He had consulted a physical therapist and another chiropractor, neither of whom could find the cause of the pain or the weakness in his arm. Nevertheless there had been some improvement in the slipped disc symptoms in his neck with their treatment, but not his arm. Mr G was an extremely well built man, with enormous muscles associated with body building. He wasn't carrying an ounce of fat. 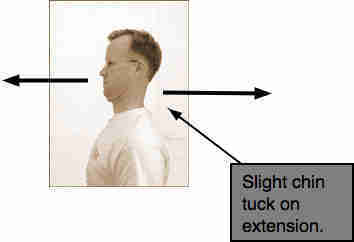 Right rotation of his head and neck, right lateral flexion, and extension, all produced pain in his neck and upper right arm. On observation, it was obvious that there was severe wasting of the right pectoralis major muscle and the right triceps. Both were very weak for such a strong man. I could overpower both, difficult even in a normal person. Kemp's test and the Upper Limb Tension Test were extremely positive, with pain in the lower cervical spine (C7 in particular) radiating radiating tingling in the arm and hand. Tingling in arms and hands absolutely must be taken seriously if there is a suspected slipped disc in neck. The triceps reflex was absent and there were sensory changes in the middle finger; on pinwheel testing there was numbness. In short, there were so called hard neurological findings, affecting both the sensory and motor nerves. Slipped disc symptoms in the neck can be very severe, and unresponsive to medication. Depending on the severity of the bulge you may have a variety of symptoms; if it affects just the sensory nerve causing pain, tingling and numbness in the arm. 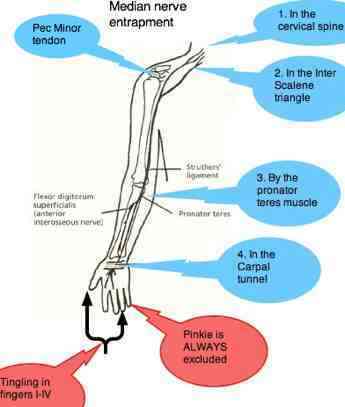 If the motor fibre is pinched then there will be loss of reflex and weakness and wasting of muscles. You may experience several of these symptoms. 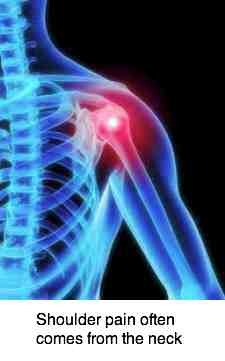 Initially, increased sensitivity in the arm known as hyperaesthesia. 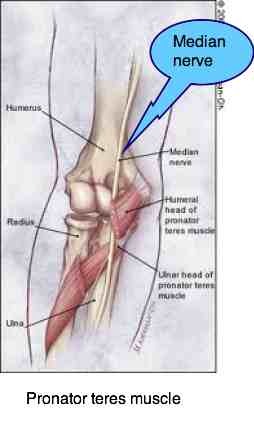 Later numbness develops, usually in a single dermatome; that's an area of skin supplied by just one nerve root. 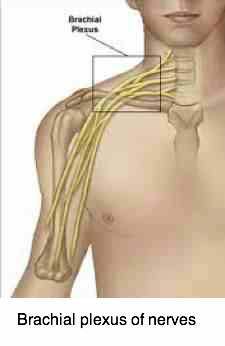 Wasting of the muscles affected then occurs. 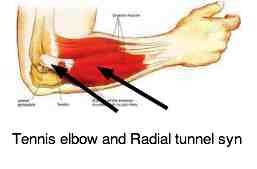 Extending the elbow, straightening it against resistance, is commonly weak. The shoulder abduction relief sign is a strong confirmation of slipped disc in neck. 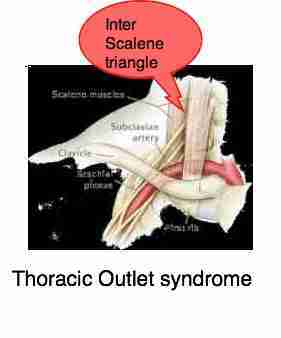 Conversely, relief of pain and tingling in arms and hands points to a tethered nerve and positive artery in a thoracic outlet syndrome. 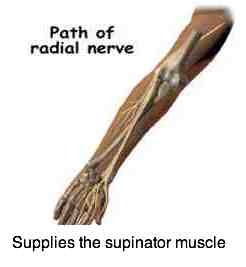 There is increased pain in the arm when stretching out the limb. Carrying a briefcase or a heavy package of groceries places increased stress on the injured nerve root. Conversely, placing your hand on your head, or sleeping with it under your pillow takes the tension off the nerve. The result is relief when raising your arm. 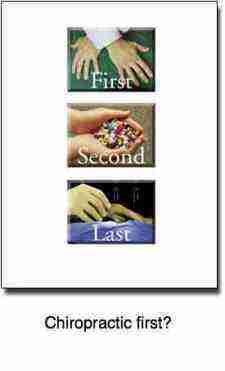 Periodically a patient walks into the clinic with his or her hand on their head; the diagnosis is often already made. 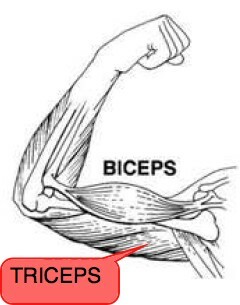 It's known as the Shoulder Abduction Relief sign. The deep ache in the arm is often worst at night. 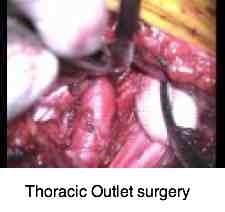 A slipped disc in neck is certainly one of the most difficult conditions to manage in any practice. It frequently leads to surgery, which in itself is complex and not without danger. Approximately one in a thousand patients die during or soon after the operation. Others either receive no relief or have increased pain. The same of course could be said about chiropractic patients. All professions find this a challenging condition to treat. 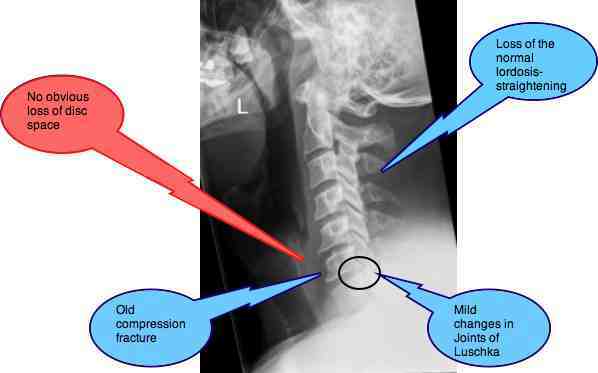 A positive Spurling's test is a strong indicator of a slipped disc in neck; however advanced degenerative changes in the uncovertebral joint Luschka can provoke it as well. Spurling's test is done by turning your head to the painful side and then looking up; do you get pain and tingling in your arm? My right neck, arm, leg and foot are experiencing tingling and burning sensations. Sometimes my foot will feel like it has fallen asleep as well. Also, occasionally, the right side of my face feels numb. I have previously had L2-L4 interbody fusions, Disk repair, somewhere around L2/3 and C4-C6 interbody fusions. The pain is unbearable at times. Sitting, standing and walking are the worst. Please help!! Avoidance of looking up, particular with rotation. I was insistent that he ceased with body building for a period, certainly his upper body, something he was only partly compliant with, to his detriment. Eventually he learned: "Those who will not hear, must feel." 20-6-2011: T6 adjustment, cervical spine mobilisation and axial traction. 23-6-2011: Some improvement, but a very weak feeling remains in the right arm. Tingling in the shoulder region with Kemp's Test. ULTT test R ++ still very positive. Tric R weak. 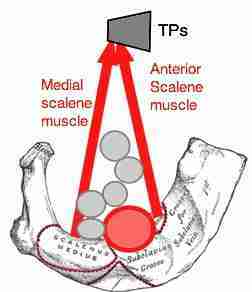 Chiropractic rotatory adjustment C7R (no release), L (release), Half nelson adjustment of upper thoracic spine. Advice: Cervical spine X-rays. (Better and safer would be an MRI, but very expensive). 28-6-2011: Definitely some improvement, but Upper Limb Tension Test (ULTT) and Kemp's test still positive. Same treatment. 30-6-2011: Further improvement. Same treatment. Oblique X-rays show mild foraminal encroachment at C5-C6 and C6-C7. 5-7-2011: Continuing improvement. ULTT is negative for the first time, and strength appears to be returning to the triceps and pec major muscles. Kemp's test does not radiate to the arm today. 7-7-2011: Continuing improvement. Same treatment. 14-7-2011: Set back after trying to do some light weights, and pull downs. Forbidden to do any upper extremity gym. 21-7-2011: Again pain in arm after forbidden training! C7 Left with release. Half Nelson. 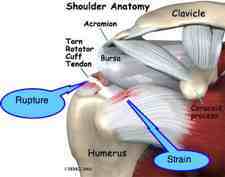 Deep soft tissue in right trapezius muscles, and rotator cuff muscles, triceps. 23-7-2011: Still very sore, especially at T3. Kemp's test pain bilaterally, but only in neck. 26-7-2011: Improving again. Same treatment. 23-8-2011: After a month's holiday, almost no neck or arm pain. Range of motion is good, Kemp's test is negative and ULTT is negative. Strength has returned to the triceps but wasting of triceps and Pec Major is still evident. 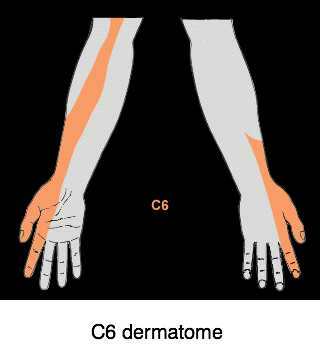 Occasional tingling, now in thumb and forefinger (C6 dermatome). No manipulation today. Axial traction, cervical mobililisation and soft tissue work. Whether Mr G can return to body building or not remains uncertain. Certainly a month away from his weights has done him a power of good. He's happy. I'm optimistic, but clearly it's the weak link in his chain... and another slipped disc in neck is quite possible. Go from SLIPPED DISC IN NECK to deep upper back pain. "My thumb, forefinger and middle finger went weak after cuff surgery." "Hello John, I take it you've been back to the surgeon. It's probably temporary inflammation of the median nerve, but of course could be worse... I'm afraid I don't think chiropractic has anything to offer at this stage. Once everything has healed up, if you don't get the strength back, or your fingers remain numb and tingly, then I'd consult a local chiro to see if there is also a problem in your neck or the first rib. Letter from reader looking for advice. 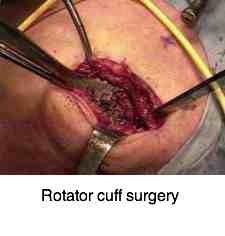 Rotator cuff - try chiropractic first. 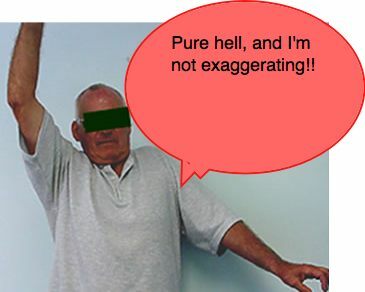 How bad is your arm shoulder hand pain?